What should couples wear for their session? What colors work well together and which ones don’t? What kind of accessories work well? We encourage our couple’s to wear outfits that are THEM but that still bring out their playful, creative side. We are a big proponent of color – all colors are great, and when mixed together in coordinating fashion – they are even better. For example, if the bride is planning to wear a dress with pink, blue & yellow patterns, we would encourage the groom to wear a shirt that suits his taste and personality but maybe in a blue shade.The colors on each of them will compliment each other! We also love to encourage our couples to bring along an outfit change so that they can add variety to their shoot. That being said, the colors of the second outfit should somehow correspond with the first so that the whole shoot can flow well together, while still being unique and colorful. In terms of accessories, they all work! Belts, earrings, necklaces – you name it! We like to highlight this stuff in our photos, so when we notice a unique accessory, we totally tie it into the shoot! What should your client’s do to get themselves ready? Hair? Makeup? Nails? We really think that people should be themselves! But professional make-up never hurt anyone. The camera loves a matte look and professional make-up comes out looking so perfect in camera! The goal of the engagement session (for us) is to capture the couples’ personalities, affection, character – so if they get too done up then the essence of who they are starts to become hidden. What are some of the best locations you have shot an engagement session? We shoot at different locations for almost every shoot. Our favorite spots are those where you would never suspect that a shoot could go on there. For example, we love finding random spots off of main roads and we are constantly scouting for new locations. Once we find a spot, we add it to our list and try to alternate between sessions with looks we are going for. What kind of props work? Which ones don’t? We think any prop that helps create a space that will give the couple comfort during their shoot… and help highlight the couple’s personality is perfect for their engagement photos. 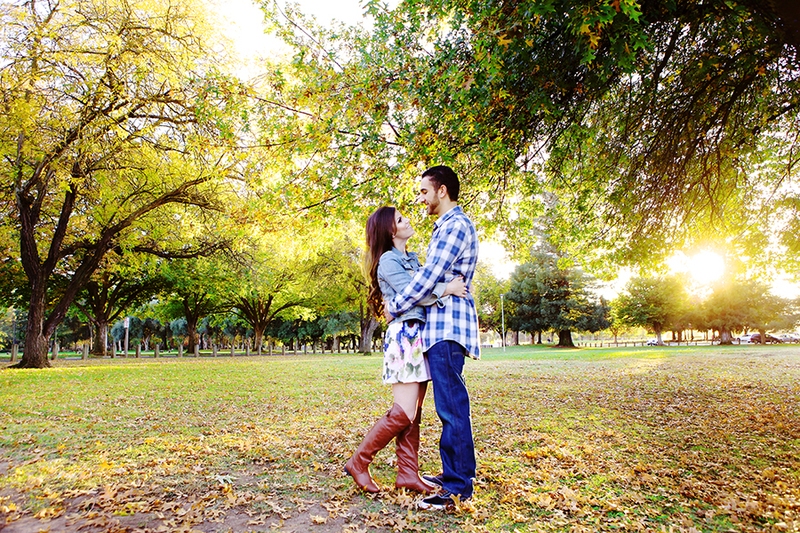 What would be the biggest piece of advice you could give to a couple about to take their engagement pictures? When it comes to the camera, no one is prepared for what is to come! The best advice we could give someone is to be themselves and have fun with it! It’s not every day that you get to spend 2 hours together doing nothing but staring into each other’s eyes, holding hands, hugging, kissing and being super sweet to one another… so take advantage of that time! And for our clients – we want them to forget we are there! If we need you to do something specific, we’ll let you know but otherwise we just want to capture photos of you guys being genuine and being together. When you forget about the camera and let loose, the best photos are created because the best moments happen right before our eyes.